I’m fascinated with Spanish culture. I love hearing the rapid and intrinsic passion when played from a Spanish guitar I love the vibrant colors found in clothes, pottery and flowers. I love the hot-looking men, the beautiful women and the succulent and spicy food. Upon visiting Spain a couple of years ago, I became submerged in the world of tapas. Tapas are bite size morsels of goodness, varying in ingredients, designed to curb a Spaniard’s appetite before sitting down to big dinner, which comes late in the evening. Like a moth to a flame, I found myself seeking out tapas recipes, which is how I discovered empanadas—small meat pies (although the filling inside can also be 100% vegetarian-just sub 2 cans of cooked black beans for the meat and/or double up on the bell peppers and use other fresh ingredients like spinach or carrots. 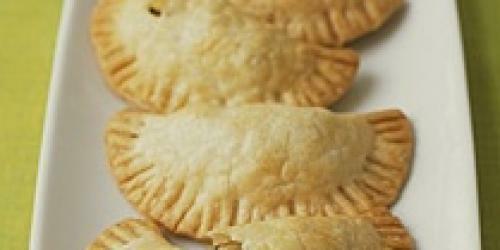 If you’re looking for something hot, quick and healthy, try making empanadas. I’ve used them as a bartering tool for legal advice, website design, and yard work. I double up on the recipe whenever I make them, because they’re real crowd-pleasers! Leave the discos out at room temperature until defrosted (at least an hour) and then put them into the refrigerator until you’re ready to use them. Place the first nine ingredients into a slow cooker (I have a crock pot I picked up for $5 at the Thrift Store. Cook on the lowest heat setting for 12 hours. It works well to do this overnight. Remove meat and residual onion and drain liquid. Pull the meat off of the bones and put it into a large bowl. Preheat oven to 350 - 400 degrees, depending on your oven. Finely chop, or use a food processor (my food processor was yet another empanada barter) to cut up the second onion, peppers, and cilantro. Stir these ingredients in with the meat. Use a table spoon of filling and place into the middle of each round of empanada dough, add cheese. Fold over and lay onto lightly greased (olive oil works) cookie sheet. Use the back of a fork to close the ends together; making a decorative pattern. Set timer for 20 minutes. Flip empanadas over and bake for another 20 minutes, or until each side is golden brown. Yum. Eat while hot, or refrigerate for later and reheat. I’ve even frozen them. One more tip: I love dipping my hot empanadas into a bowl of cool guacamole. These sound like the perfect savory treat for a Friday night. Thanks for the “budget” mini-vacation to Spain! I tried these & they were delicious. In brokeass fashion I used leftover chicken (from a crockpot dish similar to this). The “discos” dough is so easy to work with. These were very easy, yummy & looked impressive, as if I slaved away all day making the dough (I didn’t). Thanks for a great recipe! Thanks for this post , was quite interesting . This post was truly top of the line and brilliant exertion and introduction of your script style. It would be ideal if you stop over to my casa for a little Spanish gathering and parcels and heaps of newly made panamas. That sort of motion picture individuals honestly appreciates it. Oh wow this recipe looks good i should really try it out, anyways i do custom writers over here so ill definitely put in a good word for you there so that they can contact you guys for more work!! Good work and thank you for sharing this.I think you have to add more details. This is the best blog for wishes to be alerted of this subject. You realize a lot its virtually hard to suggest together with you (not that I really would want … HaHa). You actually placed the most up to date spin with a topic that’s been discussing for years.